CPC Technologies | Business Solutions Experts Since 1972! 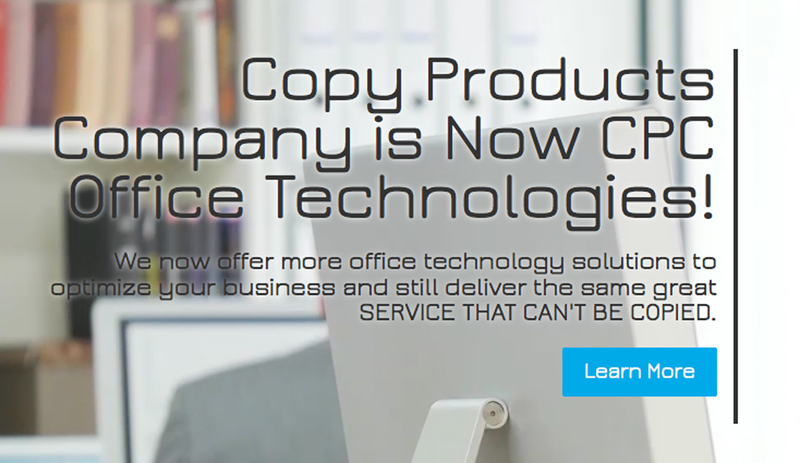 Copy Products Company is Now CPC Office Technologies! We now offer more office technology solutions to optimize your business and still deliver the same great SERVICE THAT CAN'T BE COPIED. With CPC Office Technologies’ selection of Document Solutions, you can convert paper documents to digital files, access your information via the cloud and route and track your electronic documents. We don’t offer just one solution or try to make a square peg fit in a round hole. We offer a wide assortment of products and services and tailor solutions to meet the needs of various industries. CPC's Technology Cooperative with Digital Boardwalk will help you build your network and business website from the foundation. Not only that, we can work to ensure your uninterrupted productivity. CPC Office Technologies offers an outstanding selection of Managed Print Services to help our client's to lower your expenses, track your information better and more. CPC Technologies offers the latest technology from the industry’s leading innovators! CPC Office Technologies has served the Grand Hotel for over 15 years. With our large fleet of products, we know we can count on them to keep us up and running. If something isn't right, I know that I can call Lane Hodges and Jim Pearce to get it taken care of fast. CPC Office Technologies takes care of us so we can take care of our guests. It is my pleasure to recommend the services of Copy Products to you. The company offers top-notch quality, service and rates. Across the board, we are always pleased with their work. In this day and age of electronics documents, and the transmission of them, we all need a company we can rely on and trust. I highly recommend them and look forward to a long lasting business relationship with them. They are not only very responsive and timely but are also very proactive in understanding our specific business needs and offering different technology solutions to help us improve our service and save money. We had a “toner emergency” this past Monday, and Gregg and Thomas went above and beyond at 7-8pm to get us the toner we needed to be prepared for the next day’s all-day mediation.